Northamptonshire’s men are gearing up for a huge weekend of bowls action. The county take on Dorset in the semi-finals of the National Liberty Trophy competition on Saturday. And 24 hours later, Northants will be up against Warwickshire in a winner-takes-all clash for the Midland Counties Indoor Men’s League’s Warwickshire Trophy. The Liberty Cup match is being played on the neutral green of West Berks IBC in Newbury from 10.30am on Saturday. The other semi-final is between Leicestershire and Lincolnshire with the winners of the last-four clashes set to meet in the final at Melton & District IB on Sunday, April 12. The following day sees the top two in the table clash at Welford-on-Avon IBC (2pm). Northants and Warwickshire both have 100 per cent records with the former sitting on 56 points and the latter on 52. The teams for both matches have been selected. Rink one: Richard Lemon, Chris Bland (both Northampton & District), Darren Childs, Jamie Walker (both Wellingborough). Rink two: Dave Flippance, Connor Cinato (both Desborough), Dominic Graham (Northampton & District), Paul Broderick (Wellingborough). Rink three: Dave Love (Wellingborough), Tony Dicks (Daventry), Jim McKee, Vernon Gearey (both Kingsthorpe). Rink four: Matt Pownall, John Haines (both Desborough), Ben Sharpe, Mick Sharpe (both Kingsthorpe). Rink five: Mark Corbyn, Bob Fuller, Phil Exley, Neil Corbyn (all Wellingborough). Rink six: Andy Smith (Northampton & District), David Walker, Andrew Manton (both Kingsthorpe), Callum Height (Wellingborough). Reserves: Chris Maden, Darren Lewis (both Kingsthorpe), Tony O’Leary (Northampton & District). Rink one: Will Clelland, Peter Mellor, Norman Gibb, George Warren (all Desborough). Rink two: Roger Summers, Ashley Linnell, Tony O’Leary (all Northampton & District), Jason Bryan (Kingsthorpe). Rink three: Pete Maloy (Kingsthorpe), Bob Fuller, Walt Winsor (both Wellingborough), Chris Bland (Northampton & District). Rink four: Dave Love (Wellingborough), Alan Baulch, Tony Weston (both Northampton & District), Dave Flippance (Desborough). Rink five: Adam Pitfield, Kyle Buckley, Malc Mattinson, Martin Keech (all Rushden Town). Rink six: Jim Diver, Matt Pownall, John Haines (all Desborough), Matt Cattell (Rushden Town). Northamptonshire have sealed a place in the final of the National Over-60s Championship. The county will take on Hampshire at Nottingham IBC on Sunday, March 22 (1.30pm) after beating Yorkshire on an extra end after their semi-final finished level at 113-113. It proved to be a thrilling encounter at Gedling IBC in Nottinghamshire. Things were not looking good for the county in the early stages. Yorkshire opened up a 22-shot lead after five ends with only one of the Northants rinks being in profit while two of them failed to score a shot at all. But the next five ends produced an incredible turnaround. Yorkshire were very much under the cosh as Northants picked up 39 shots compared to 16 for their opponents and that was enough to give them a slender one-shot overall lead. The next five were pretty close but the county took a small lead of five shots at that stage, although that had been cancelled out soon after with the two teams level at 97-97. At the end of the scheduled 21 ends by every rink the scores were still level at 113-113 thanks to a pick-up of five shots on the last end by one of the county’s rinks. This resulted in the playing of an extra end by rink three and it was the Northants line-up, led by Tony Weston, who triumphed. scoring rink was the one skipped by Jim McKee as they won by 13 shots. Rink one: Jim Diver, Pete Maloy, Pete Mellor, John Haines 13 I Reddy 23. Rink two: Alan Baulch, Bob Care, Walt Winsor, Alan Ramscar 18 A Horobin 19. Rink three: Mick Richardson, David Bailey, Malc Mattinson, Tony Weston 20 J Whitley 19. Rink four: Tony Dicks, Bernard Spreadbury, Martin Keech, Mick Worthington 18 A Jones 21. Rink five: Roger Summers, Colin Manton, Colin Jones, Jim McKee 26 B Johnson 13. Rink six: Will Clelland, Pete Morris, Norman Gibb, George Warren 18 G Brooks 18. 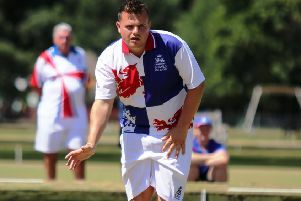 Northamptonshire will be well represented in the British Isles Indoor Bowling Council Championships next week. The competition is held for men and women national champions from Scotland, Wales, Ireland, the Channel Islands and England. Four county players will be in England colours for the Championships, which are being held at Stanley IBC in County Durham between Monday and Wednesday next week. They are for the winners of the various indoor disciplines, including the main Singles, the Junior Singles, Senior Singles, Pairs, Triples and Fours, including the Senior Fours. The county’s champions are Chloe Wordingham (Wellingborough IBC), who will contest the Junior Women’s Singles, Jamie Walker (Wellingborough IBC), who will be in the main men’s Singles, and Andrew Manton and Neil McKee (Kingsthorpe IBC) who will be in the Pairs. Wordingham begins her campaign on Monday (6.30pm) when she takes on Ireland’s Chloe Weston. Walker has a bye to the semi-final of his competition where he will meet either Billy Mellors (Scotland) or Thomas Greechan (Channel Islands) on Tuesday (11.30am). Meanwhile, Manton and McKee will be up against Jordon Davies and Phil Carpenter (Wales) at 2pm on Tuesday. Success for the county players in these matches will see them competing in the final of their discipline, which will be held at either 9.30 am or at 2pm on Wednesday.